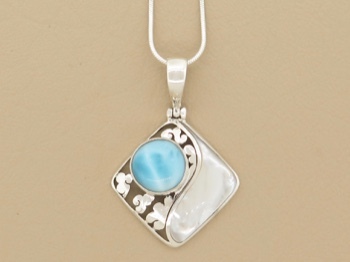 Gentle wave of mother of pearl illuminates this larimar stone set in an ornate sterling silver frame. 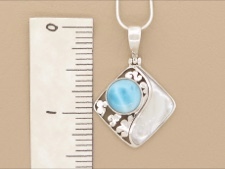 Larimar is a rare stone found only in remote mountain regions of Dominican Republic. Mother of pearl is a natural blend of minerals that coats and protects the shell lining of mollusks and oysters. 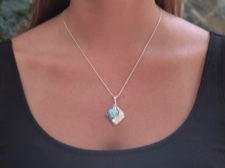 This necklace is a tasteful blend of land and sea!